Petra Cortright. 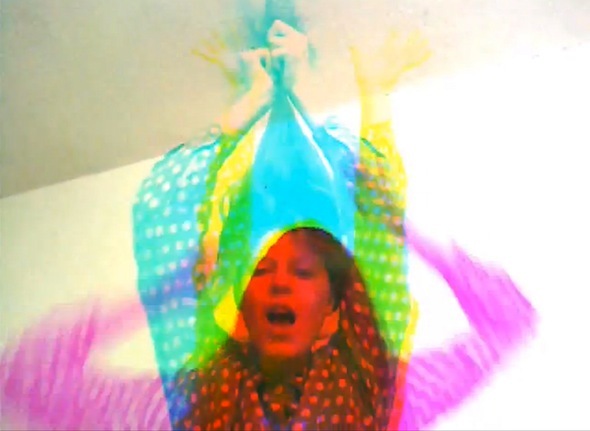 RGB,D-LAY, 2011. Webcam video file. Edition of 5. 1 AP. Courtesy of the artist and Steve Turner Contemporary, Los Angeles. Last night, Rhizome was the beneficiary of the Paddles On! auction at Phillips auction house. Curated by Lindsay Howard and co-organized by Phillips and Tumblr, the auction brought together works under the banner of "digital art." While the sale of artworks that engage with digital technology is nothing new, there was something remarkable about the scene last night. Magda Sawon tweeted that it was "like parents forgot to lock the house & the kidz had a great party!" (She also added, "One day it may be their house or they burn it," but that's just typical gallerist-auction house repartee, we're sure.) Every lot was sold, and perfectly-coiffed bidders competed not only over digital prints, sculptures, and Petra Cortright's digital painting, but also over Jamie Zigelbaum's interactive installation and Rafaël Rozendaal's website. Rhizome was the grateful beneficiary of this frenzied activity; we received 20% of the proceeds, with the other 80% going to the artists, and when the last gavel fell, nearly $18,000 had been raised on our behalf, which will help us continue to expand our efforts to commission, contextualize, and conserve technologically-engaged artwork. At the start of the evening, I hosted a panel discussion titled "Collecting Contemporary Art Means Collecting Digital Art." The title was intended to be (to borrow artist and panel participant Jenn McCoy's phrase) both generous and provocative. Generous, because it sets up quite an inclusive conversation, in which it's possible to think not only about people like Casey Reas and Rafaël Rozendaal as digital artists, but also Takashi Murakami and Andreas Gursky. But it's also provocative, because it suggests to collectors that if the work on their walls doesn't engage with digital technology and the issues that it raises, it might not be that contemporary. For the panelists, the title was also provocative for its use of the phrase "digital art." Many artists for whom new technologies form a central part of their practice do not describe their work in these terms. On the panel, Jenn McCoy suggested that digital art is not a medium; after all, no one describes themselves as an "analog artist." Steve Sacks, owner of Bitforms Gallery, later told me that he thinks of digital code as an artistic medium rather than "digital art." But in the context of the auction, the phrase "digital art" came across as an interpretive descriptor rather than a material one. While all of the works included did involve digital code at some point in their process, so does nearly every contemporary photograph; what differentiates these works (and holds them together as a grouping) is their critical engagement with varying aspects of digital technologies. During the panel, Sacks also argued for the alternative term "new media," as this suggests more of a continuum of practices based on artistic experimentation with new tools, encompassing not only digital artists but also electronics tinkerers of the 1970s or biotech artists who work with DNA. While "digital art" connotes engagement with a specific technology, "new media" has its own specificity, reflecting an interest in the expanded creative possibilities afforded by new tools. Panelist Rafaël Rozendaal defended the use of the term "digital art" instead of "new media," but his particular interest in it related to the potential for digital work to circulate online. This is an interesting point, because the phrase "internet art" or "net art" has often been used to describe the work of artists who use the internet as a medium, but many artists today are simply using it as a space in which to connect with an audience and circulate their work. At Rhizome, we describe our field as "artistic practices that engage technology." This phrase, while useful for connecting various kinds of stances together, will never end up as the title of an evening sale. It seemed clear that collectors were interested in engaging with "digital art." We don't agree with Moody's characterization of digitally-derived objects as "souvenirs"—after all, digital prints and digital celluloid films were produced and circulated widely before it became convenient to display digital works on screens—but we share something of this weariness with having the same Groundhog Day-like conversations. So it's refreshing to think that we may be leaving this conversation behind and entering a strange new one. Instead of championing a field that has been somewhat neglected by collectors, we may now find ourselves addressing new levels of interest in owning technologically-engaged art. If this is the case, our task will be to continue doing what we can to raise consciousness about the history of the field and champion underrecognized and emerging practices within it. Updated to include the fact that 80% of sales went to artists and 20% to Rhizome. Two things came to mind while I was reading this. First, I am amazed that after a half century, the conversation about what we should call artists using electricity in their process is still up for debate. Digital Art, New Media, Art and Technology, Electronic Art; will we discuss these terms forever? Can we just call them artists and move on? Maybe it's our insistence on giving this debate an audience that reinforces our place in the artworld's digital ghetto? Like the song says, "…movin on up, To the east side. To a deluxe apartment in the sky." Second, it is great and well deserved that so much money was generated for Rhizome through this benefit auction; Rhizome is a fantastic organization that has been immeasurably important in the proliferation of "digital art". I wonder though, how often these "digital art" benefactors/collectors would normally open thier check books to fuel these type of artists directly? The age of artists as both producer and benefactor seems to have taken hold. I wonder if Michelangelo would have sponsored the church by donating all his time and work? Maybe if he was using pixels and arduinos he would have? My use of the term "souvenir" referred to an established practice of selling documentation for "immaterial" performances, happenings, etc. The classic example: Chris Burden had himself nailed to a Volkswagen in the 1974 piece Trans-fixed. The objects for sale were documentary photos, explanatory text and the actual nails, on a small stand. My point in mentioning such precedents was to say that selling the immaterial wasn't new. Some digital works might be represented in the market by Burden-like mementos, others may not – I wasn't saying all "digitally-derived" objects were souvenirs.